In this post we are going to learn how to create ajax pagination without page refresh by using Ajax with Jquery, PHP and Mysql. Ajax Pagination is most helpful to display set of table data with no any page reload event. Inside ajax pagination ajax call will deliver asynchronous manner for that web ajax call will do work coordinate with another ajax call. In most of the web based application, pagination or pager is a most necessary part where large numbers of data are fetched from the database table. In those type of case, Pagination with Ajax is a excellent style this is because it will relief to develop the User Interface of your web based application. In This post, I will display how can you apply the Ajax pagination in PHP using jQuery and MySQL. 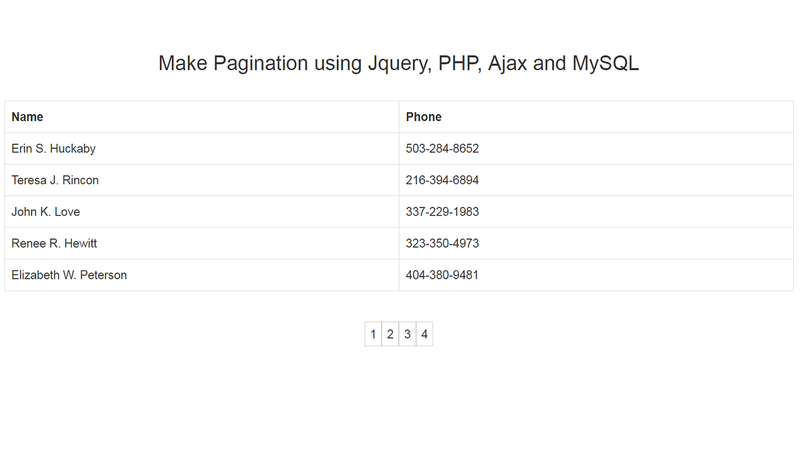 I have created the very simple but powerful pagination script to make pagination with jQuery, Ajax, PHP, and MySQL. I have using php and I will fetch the student data from the MySQL database with the pagination links and this pagination links, you can pull the database table data except the visibled data. jQuery and Ajax will be helpful to fetch the data from the database table as per on pagination links without refreshing whole the page. I have describe complete in this video tutorial, you can see the video and learn from this video tutorial how to create pagination by using Ajax with Jquery php and mysql. I have also provide source code here also. Thank you so much for your post. But I want to do something different. I want pagination comes like - 1 2 3 4 5 ...... 10 20 30 40 50 [next] . because i have lots more data. So can you please give me an idea how can I do this ? ?